Why Do Dogs Hate Vacuums & How to Deal with It? Understanding Why Your Dog Hates Vacuums & How to Deal with It! Why do dogs hate vacuums? This is a frequently asked question by dog owners due to individual personal experiences when it comes to dog handling and breeding especially in homes. The sight of these mechanical monsters set the alarm bells ringing for domestic pets and dealing with this problem can be just as complicated as it is frustrating. Why then are dogs afraid of vacuums? 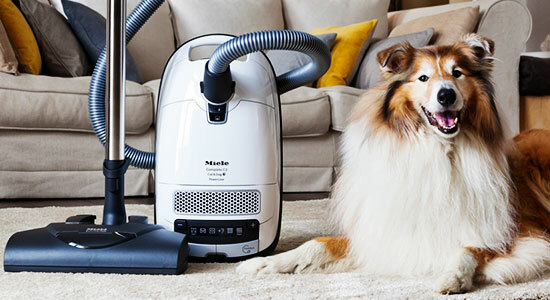 How can you vacuum pet hair without frightening your lovely pet? Why Are Dogs Afraid of Vacuums? If a domesticated dog is not groomed right from the start to get used to vacuums, it is certain that the pet will come to view it as a menace and gradually develop a phobia for it. Puppies that are well trained grow up to be accustomed to different sound frequencies, objects, and scenarios in the home and the surrounding environment. Some dogs like the Chihuahua and Affenpinscher are very frightful pets when in close contact with strange objects and people. The average Dog tends to be fearful and nervous not just around Vacuums but also Human Beings whom they consider strangers. Dogs being clever animals can tell the difference between a human and an object. Objects are not meant to move like vacuum cleaners do. 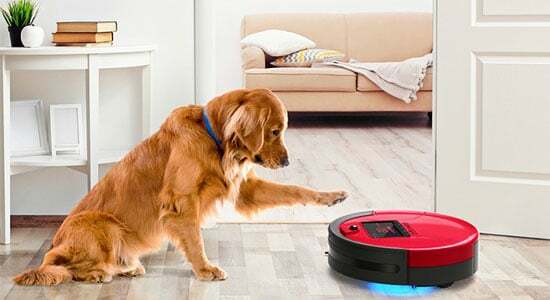 A moving vacuum cleaner is a bizarre sight to behold for a dog and they are bound to react negatively to this strange creature. When faced with a strange intruder, some dogs choose flight while others choose to stand and defend their territory. Dogs being territorial in nature may have a heightened herding instinct when dealing with strangers including the vacuum device. 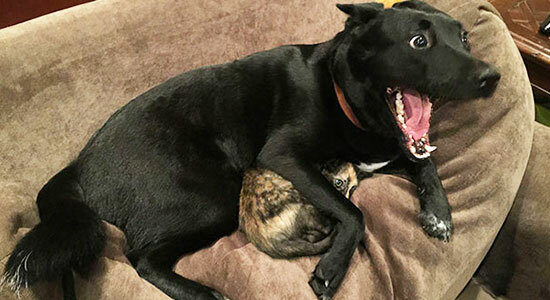 This canine phenomenon holds even truer for territorial dogs like Mastiffs and Sheppard Dogs when confronted with an intruder. Dogs have good ears for picking up sounds at different levels of frequency. What may appear as a mid-level sound to human ears may actually come out as a very discomforting one to a dog. The noise made by a vacuum tends to cause dogs distress when turned on. They react to this sound fearfully or aggressively, even if it’s a pet hair vacuum cleaner specially designed for homes with pets. When confronted with the noise, odor, and sight of a vacuum cleaner, Dogs react in different ways based on their basic natural temperament. There are telltale signs to watch out for in your dogs to identify behaviors of distress. Like animal experts will point out, drooling is a reactive action in dogs and not a behavior. Dogs drool for several reasons, one of which is in cases of distress and anxiety. The sight and sound of a vacuum cleaner can be terrifying for a dog and even for a cat. 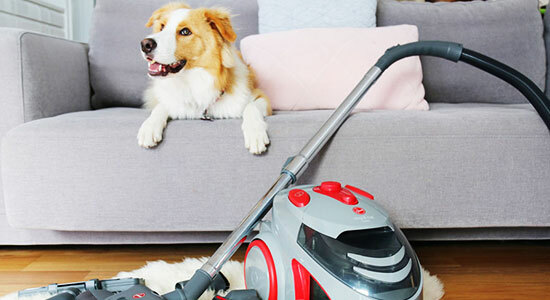 If your dog starts salivating profusely anytime your vacuum comes on then you need to watch it and seek ways to calm its nerves during and after use. Animals with the instinctive inclination to take flight when faced with a potential risk run for protective cover. If your Dog keeps running under Tables and Chairs especially when the Vacuum is switched on, this serves as a strong signal to show that it is scared of it. Dogs choose to hide under furniture because they feel that in such a position the Vacuum won’t get to them or hurt them. The tight spot gives them a sense of protection from harm. This is another reactive trait in dogs many are not aware of. Dogs pee not only to release waste but also when they are scared. Constantly urinating at the sight of Vacuum cleaners is another indication of a dog that is afraid of vacuums. You need to take note of your dog’s urinary habits. In some cases in relation to species, some dogs pee indiscriminately inside the house when the Vacuum is turned on. When a well-groomed dog frequently does this, it shows anxiety and distress. A dog pacing in different directions at irregular intervals inside the house when the Vacuum cleaner is in use is showing signs of unease and fear. Wandering outside the house is one thing; doing so inside is an abnormal behavior. Dogs bark when they are in fear or feel challenged; being territorial creatures, they will bark at anything or sound that threatens their space. If your dog starts to bark all of a sudden inside the home then it is a sign that it is disturbed. Barking at strangers is expected but barking loudly when there is no stranger around but a working Vacuum is another indication of fear. Also Read: How Can a Humidifier Improve Your Health? Check This Out! 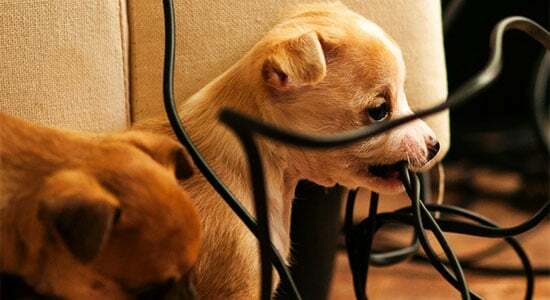 Is your dog chewing on cords and wires, tearing open pillows or gnawing at armchairs when in close contact with a vacuum device? It is doing so out of hate or fear. Dogs react differently and destructively sometimes when they are scared of something. There are different methods that can be applied in tackling the issue. I recommend three crucial steps in understanding and evaluating the situation before looking for solutions. The first step is accepting that a vacuum which appears harmless to you can actually appear dangerous and threatening to your pet. After accepting this reality you will then need to identify how your dog reacts each time the vacuum is turned on. Observing this closely will better help you understand why dogs are afraid of Vacuums. The third step is finding a way of soothing your pet’s nerve in trusting you as its owner and making it more familiar and accepting of the device. Having taken these three steps you can then proceed towards finding a solution by exploring these tips. Storing your vacuum cleaner in an enclosed area will not help your pet keep calm when next you decide to make use of the cleaning device. 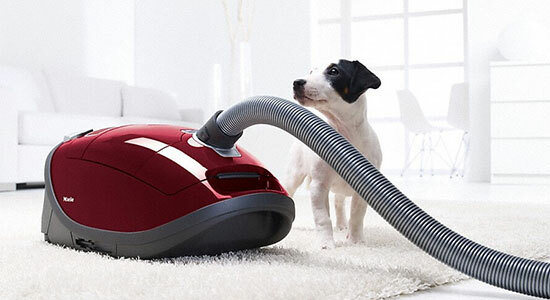 Keeping the vacuum in an open area will help your dog or cat sniff around the device and get used to it. Keeping the cleaner low to the ground in an open area will help for easy access. In this position, your dog or cat can easily come close to the device when it is not switched on. 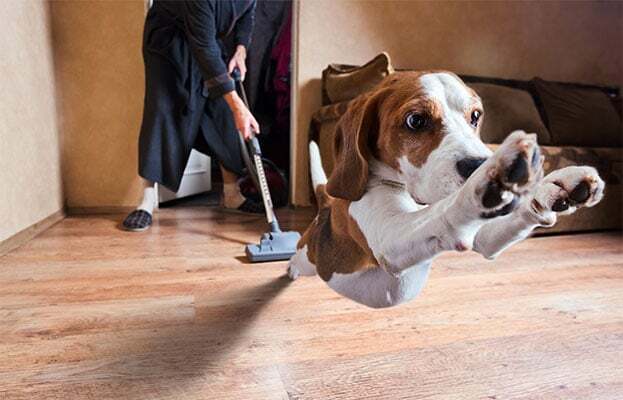 When working the vacuum, do not prevent your pet from coming close to the device if it wants to. Forcing it to will make it even more distressed but preventing it from doing so when it wants to will not help in the long run. Allow the pet easy access to the device whether it is working or not to aid comfort and acceptance. Switch on the vacuum frequently for a short time when you are not cleaning the house with it to help your pet familiarize itself with the sound it makes. Placing treats on the vacuum like candy bars will also help the bedding process. By doing this frequently it will come to see the device as a reward provision system rather than a dangerous one meant to cause harm. You can initially start by placing treats on the vacuum when off then slowly introduce the treats when the system is on. Dogs and cats like to play and placing dog toys close to the vacuum will make your pet comfortable around it. Balls are very good toys to utilize in this regard. 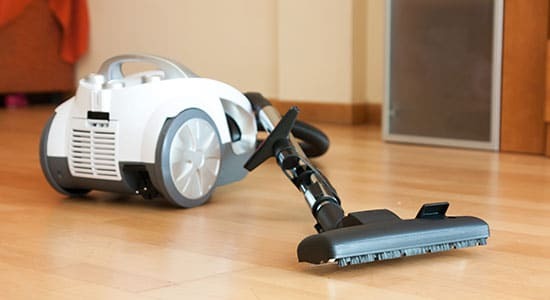 During cleaning, endeavor to keep the device at a central location in the room you are cleaning while you use the hose to seek out dirt and debris from the various corners of the room. Doing this will not make your pet feel threatened due to the constant movement of the vacuum machine. After every cleaning exercise, make it a duty to reward your pet either with toys or treats. This practice will make it more amenable towards the Vacuum usage at home. A comfortable and happy pet brings about a more comfortable and happier home for all its inhabitants. Pets, in general, have fears like we all do and allaying those fears is a responsibility all pet owners have towards their pets. “Why do dogs hate vacuums” is no longer a myth that remains unsolved. Careful observation and pet considerations will help you keep your pet happy and your home clean at the same time.